Nimue is the author of the blog “Pages from my mind” and she’s the vice-principal of a quite hectic school of review bloggers called “A Lot of Pages” (this blog, just in case you missed the title). She’s a fun-to-be-with, talkative, friendly, smiling gal with an appetite for reading books and a talent for writing poetry. 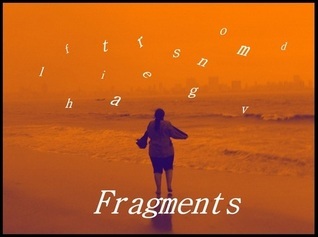 “Fragments” is her debut collection of poetry. Some of her poems, you know, make me feel like I can be in those shoes and understand that. It’s like she’s written one of my thoughts, like we share that thought. I quote from one of her poems there titled Nightmare: “People most times, promise to stay, yet are gone”. I can feel that. I have been one who has had it both ways. I’ve promised to stay and then gone, and I’ve been promised and the promise broken. It ain’t the best of feelings I can tell you that. The poem after that is titled Broken Dreams, and that one to me defines the book. Life goes on, and we have to understand that. This poem has the healing words I feel: “I clear the way for a new and happy tomorrow.” Another favorite of mine is the poem on secrets. I’m also given a big smile by some of her descriptions before the poem. The one for the poem titled Home for e.g. : “Home is not the measured space, the color of walls, the dark and dusty corners or the smell of the cleaning liquid you use for floors. It sometimes is just the memory you create there.” Yeah, that’s home to me alright! The poem that follows quite leaves me wonderstruck (her poems have that quality). The cover, so simple yet alluring, in that orange that is so vibrant yet calming like the setting sun on the seaside, I adore that. I just wish the poetess’ name was on it too you know. The poems are something I could understand (well, mostly I guess, though how I interpret and what she means might be totally different things!) and I loved them. The explanation brings that personal touch to it. Well, I didn’t like that the poetess’ name isn’t on the cover! That was needed. And also, some poems I wished that they had a title. A collection of poetry to let you ponder, and then make you voice along with it. Nothing complex, all simple in creation. I do wish there was a Hindi poem there with its translation. A collection by Nimue sorta seems incomplete without that trademark! If your poem was supposed to be marked by my (reader’s) breath, I think that may have happened, coz I’m quite out of breath after! Also shared with IQRC and First Reads challenge. it's so cool to be ON the cover!! Congratulations on becoming a published author and lovely review Leo.